Tata Motors launched a new state-of-the-art full-range Passenger Vehicle dealership in Jogeshwari (West), Mumbai. tools for faster turnaround and would successfully fulfill all the needs of a passenger vehicle customers at a single location. 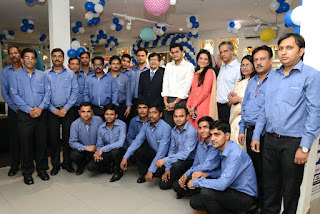 "This new dealership in Jogeshwari, Deogiri Auto, is a result of our continued efforts to increase our foot-print across the country to get closer to our customers. We are seeing good response to our new range of passenger cars in the market and have done very well. We are on the growth trajectory and will grow every month. We want to ensure that our customers have easy access to us and can experience our products hassle-free," said Mayank Pareek, President, Passenger Vehicle Business Unit, Tata Motors.